Representatives from EU Member States and the six Partner countries (Armenia, Azerbaijan, Belarus, Georgia, the Republic of Moldova and Ukraine) met in Brussels on 12 March and agreed on the key priorities for 2018 to deliver on the commitments taken at the Eastern Partnership (EaP) Summit in November last year. “Today’s meeting provided us with the opportunity to agree on what we can achieve together throughout 2018, on the basis of the ‘20 Deliverables for 2020’ commitment,” added Hahn. The meeting focused on the role of the renewed EaP in delivering results for the benefit of people according to the ‘20 Deliverables for 2020’ agenda under a new institutional set-up. This was the first meeting organised under the new institutional structure that was officially adopted at the EaP Summit to ensure a more results-oriented approach. 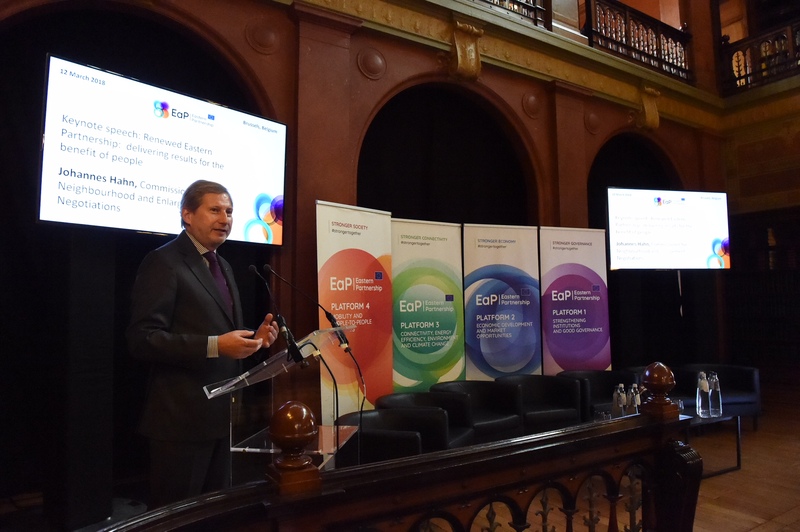 “The engagement and ownership of Member States and Partner Countries is key to guide, coordinate and steer the overall process,” Commissioner Hahn underlined in his speech. The new set-up aims at supporting more efficiently the reform processes in the six EaP countries in four priority areas: stronger economy, stronger governance, stronger connectivity and stronger society.